C-suite leaders are passionate about the financial success of the company. That’s why you had better produce measurable results for your training dollars as other department managers vie for the same monies. A lack of return or business impact from training is the biggest reason why training budgets get cut when money is tight. You have to prove you can make a difference to the bottom-line. Low employee engagement creates poor productivity, chance of employees leaving, and reduced profits. That’s why when employees indicate they are not feeling appreciated or valued for their contributions on an employee engagement survey, training is often one of the strategic solutions recommended. As a manager you are responsible for ensuring immediate supervisors and managers apply this learning back into the workplace as quickly as possible to create a positive and measurable difference. But we all know from people we’ve sent before to training programs that only some of them put the skills and knowledge into practice while others don’t. You are being held accountable for raising your department’s employee engagement scores, and especially employee recognition, because these numbers have been shown to correlate with higher customer satisfaction levels. How can you, as a manager, assist with and use training to improve recognition giving and get the results you need? The whole purpose behind training is to assist you as a manager to get the results you need. Remember, performance and making a business impact is your sole responsibility. Trainers help manage the transfer of learning process following any training sessions. And, of course, the learner is ultimately responsible for applying the actual learning of skills and knowledge from the attended training program. A few research studies surveyed both top executives and trainers about the barriers to transfer of learning. They found the lack of reinforcement on the job and a lack of involvement by upper level management (i.e., supervisors) was the number one reason given by each group. Management’s support and involvement is probably the most effective way to make the transfer of learning successful. Dr. Robert Brinkerhoff, winner of ASTD’s Distinguished Contribution to Workplace Learning and Performance Award, said in an interview, “What you do before the training and after the training accounts for more of whether it works or not, and whether the training itself is any good. That involves accountability and responsibility from people outside the learning function. It means, for example, that managers have to hold their trainees accountable for using training”. 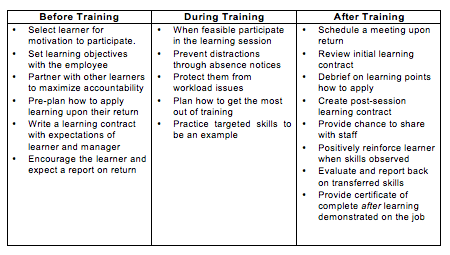 Managers assume the trainer has responsibility for the learner’s application of what they learned back on the job. In reality, trainers have very little control over learners using skills and knowledge gained in the classroom. In John Newstrom’s classic book Transfer of Training he showed that trainers identified the most frequently used method for transfer of learning was typically during training by the trainer. However, trainers clearly identified the most powerful factor for transferring of learning was before the training even began and was done by the manager. 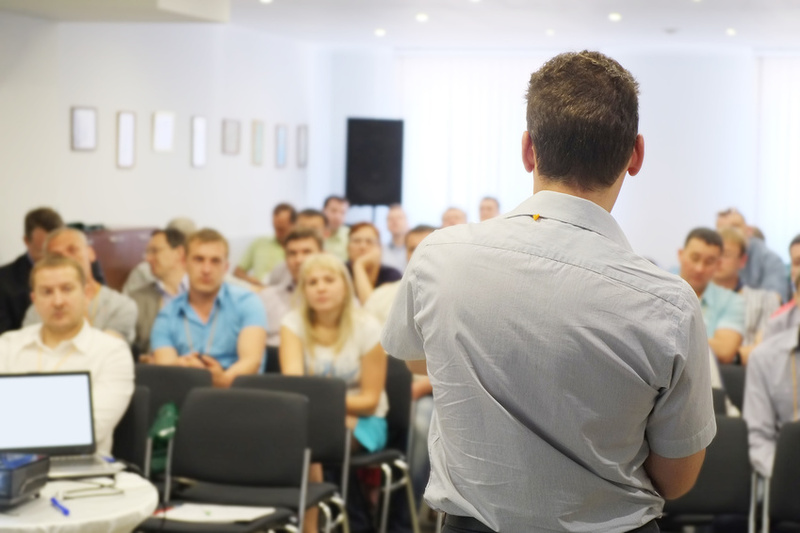 Make sure you sit down with the learner before they attend and after the training and establish some clear expectations for what is expected upon their return. Below are some sure-fire actions managers can take which will guarantee results in getting recognition skills and knowledge applied on the job.